Celebrate with a loved one by presenting him or her with the Very Special Birthday Award Certificates! 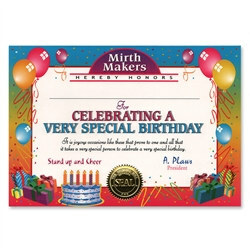 Each certificate is presented to the birthday boy or girl by the Mirth Makers and has a heartwarming birthday message. Certificates are very official looking and have a golden seal and a signature by president of Mirth Makers A. Plaws. The Very Special Birthday Award Certificates feature a border covered in gifts, balloons, cakes, and rainbow colors. Be sure to check out our other award certificates, like the Great Teacher Award Certificates and the Super Brother Award Certificates!